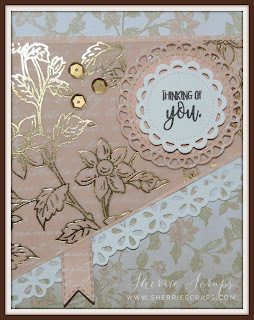 For today I would like to share a card for the August Stack-a-holic challenge over at the DCWV blog. I have been seeing some of the new stacks at Michael's and Oh my gosh, I think I need them all, lol! So many pretty patters, foils in these stacks. "Scripts & Music Notes stack from DCWV that I won recently from Cut it Up when they were celebrating their 100th challenge. It is such a beautiful stack filled with pretty patterns, some gold and even gorgeous printed vellum~thanks again Migdalia! 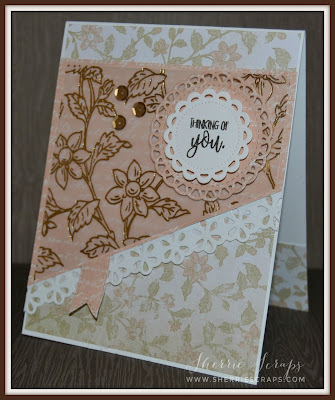 The doily is created with My Creative Time's Bunch of Stitched Doily Dies and the sentiment is stamped with the Ouch stamp set. The pretty border is from My Craft Spot~fancy Edges 2 dies (now retired) and the cute little banner is My Creative Time's Ribbon End Dies. I finished with some fun little sequins from my stash. Your card is simply BEAUTIFUL Sherrie! So Elegant... LOVE that paper! :) Have a wonderful Day! Beautiful Sherrie. Love the papers and all the foiling. Oh wow, Sherrie, these are so elegant and gorgeous!! What pretty papers!! You've showcased them beautifully!! 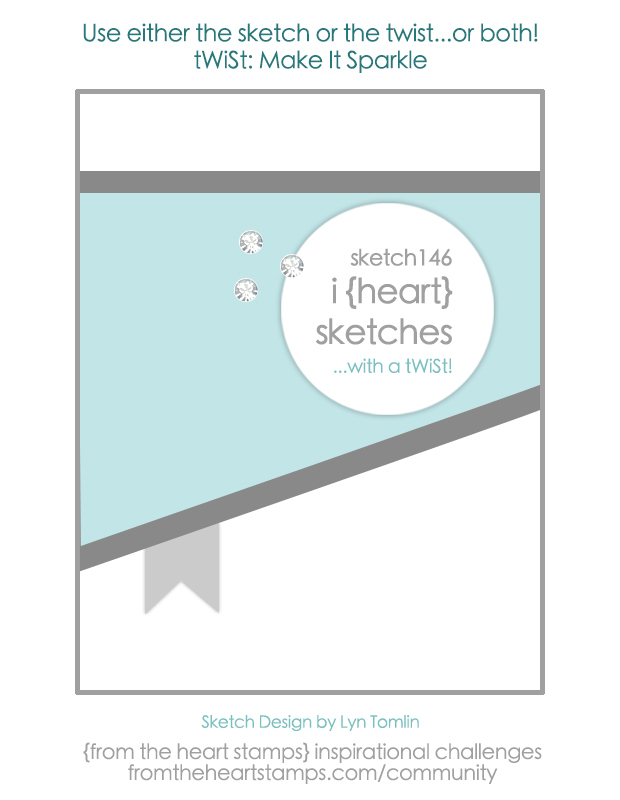 And perfect take on the sketch, too!! Love these my friend!! Thank you so much for playing along at DL.ART!! What a lovely card Sherrie! 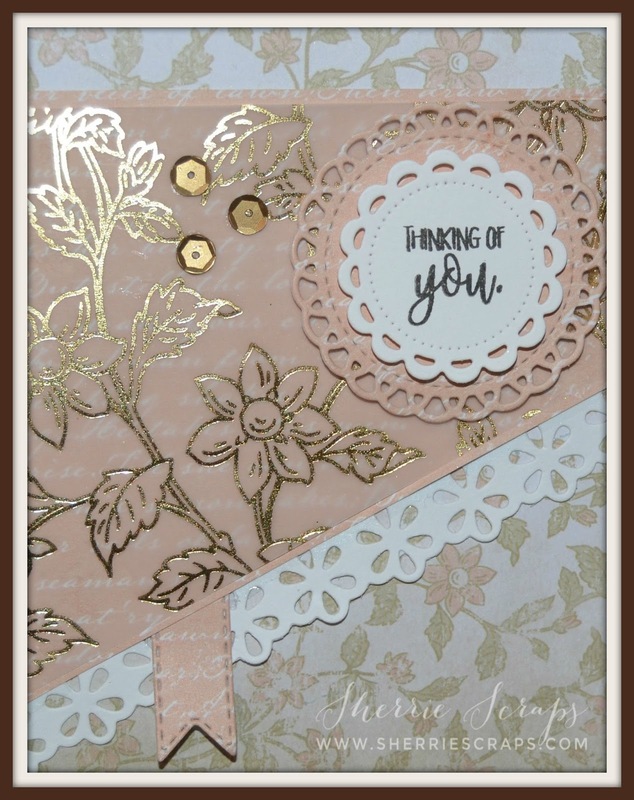 I love the soft colors, the foil print paper and the scallop eyelet edge. Great job! 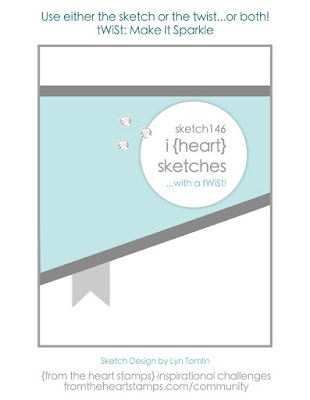 love those precious papers and awesome take on the sketch.... Enjoy your new week ahead! Such a pretty collection of cards Sherrie! 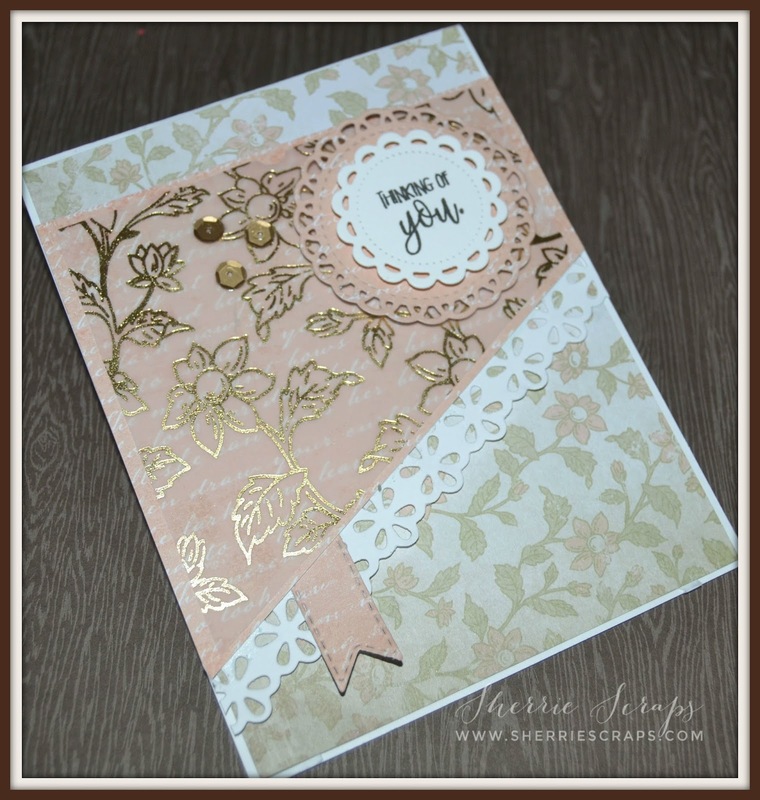 Love the mix of beautiful papers and the layered doilies! So elegant! These are just gorgeous! LOVING the colors!!!!!!!!!!!!!!!!! This is so beautiful! I need that stack! That sketch is really great too, I have to save that and use that! Thank you so much for joining us my friend this week in our Funday Friday challenge!! Hope you are having a wonderful day! So pretty!! The papers are the perfect choice! So pretty Sherrie, and the papers you used are so pretty! Sherrie these are gorgeous !!! I love the design , the papers , the colors everything !!! Fabulous card set. Love the papers you chose and the die cut edge. Thanks for joining us at Jo's Scrap Shack this week. AJ DT JSS. Beautiful cards Sherrie! I love the papers you used and the gold really stands out on your cards! Just lovely! Thanks for playing along with us at DL.ART Challenges! These are beautiful!! The gold is so elegant! Good for you creating in multiples too!